The Sahasranama Stortas address to some particular Deity and invoking him with a thousand names or less are found scattered in the Epics and Puranas. Several of them are about Ganesa, Subrahmanya, Siva and Devise, but there is only one Sahasranama Stotra in Praise in Visnu. It is found in chapter 149 of the Anusanika Parva of Mahabharata in the dialogue between Bhisma and Yudhisthira. It consists of 142 slokas. Any mention of Sahasranama generally pertains to Visnu Sahasranama on account of its popularity and perspicuity of expression. 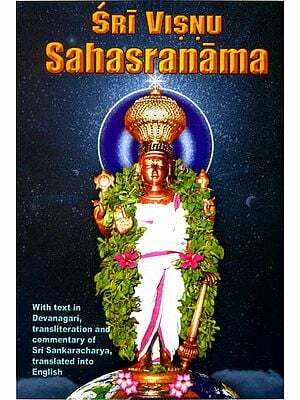 There are over fifteen commentaries on Sri Vishnu Sahasranama Stotram. Only those of Sankara and Bhatta are very popular. Sri Adi Sankara’s commentary is the earliest of them. 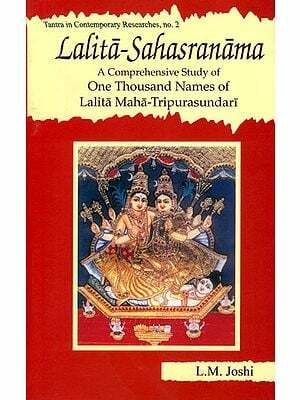 Sri Parasara Bhatta, a disciple of Sri Ramanuja, has written detailed commentary. These two commentators have expounded in a very admirable manner the tenets of their respective system of philosophy through the medium of the Sahasranama. Sri Vishnu Sahasranama Stotram, alone with the Bhagavad Gita, is an integral part of the epic Mahabharata composed by Saga Vedavyasa. Visnu Sahasranama is a stotra par excellence from all points of view. 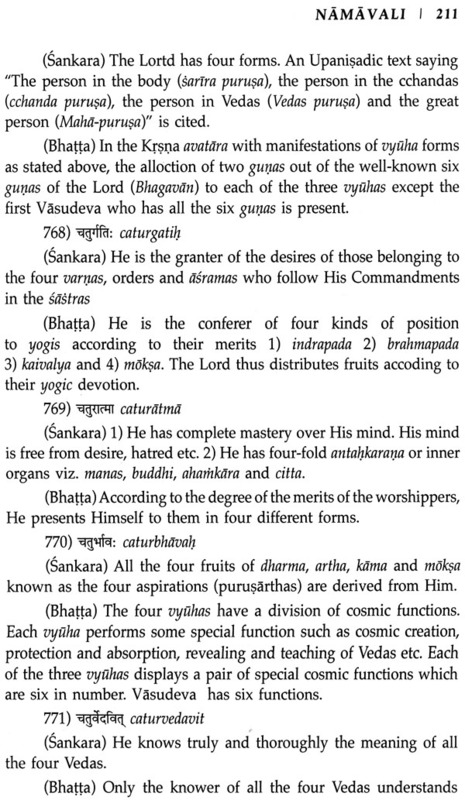 Vedavyasa has himself guaranteed all kinds of fruits to the recites. It is fervently hoped that a critical and reverent study of the stotra with the illustrious commentaries of Sankara and Parasara Bhatta will stimulate in seekers an unquenchable thirst for the joy of God-Knowledge. The name of God is everything. Its glory is as inestimable as the glory of God Himself. 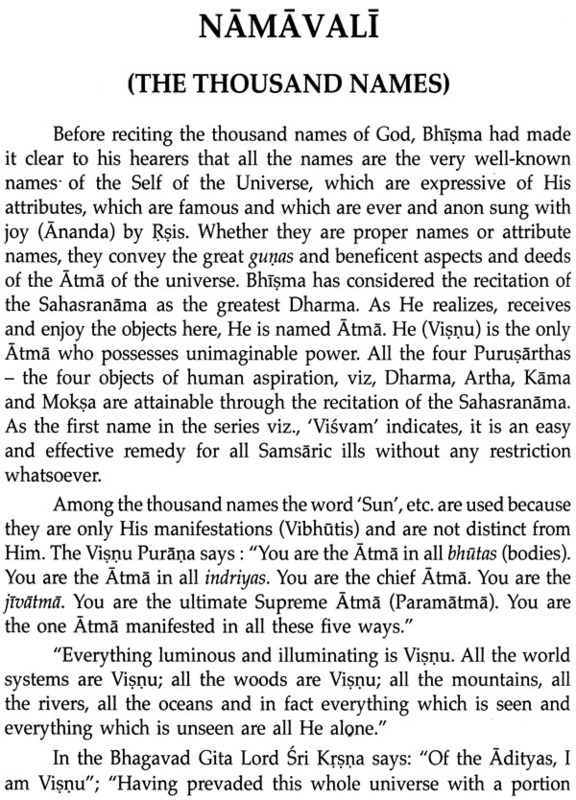 The Visnu Sahasranama says that names are gauna i.e. 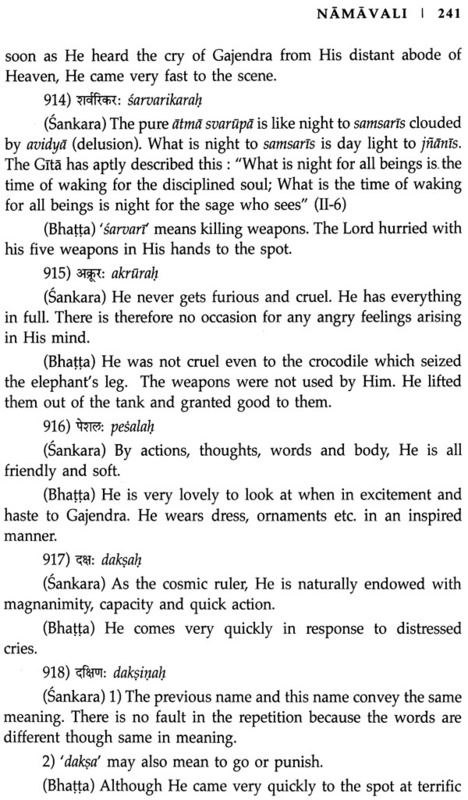 based on gunas or attributes. They are not mere empty sounds. The Bhagavata Purana syas that the names of the Lord are each expressive of the fame, exploits and greatness of the Lord. As the Lord’s excellences are infinite, so his names are also infinite. In seeking God through praise and worship, there are three forms of approach; firstly, to describe in a varied and poetic manner the greatness and glory of God; secondly, to expatiate on His varied glory by several significant attributed in the form of manifold names and lastly to invoke His grace and succour by the repetition of only one name of his. Under the first category come all poetic hymns, under the second Sahasranama, Astottara Name and the Namavallis sung in Bhajans (congregations of worship); and under the last come Nama Parayana or the repetition of a single name, Rama, Krsna, Siva etc. 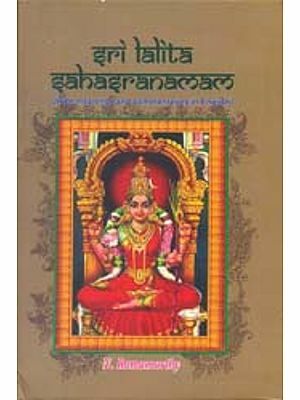 The Sahasranama Stotras address to same particular Deity and invoking Him with a thousand names or less are found scattered on the Epics and Puranas. Several of them are about Ganesa, Subrahmanya, Siva, and Devis (Lakshmi, Lalita etc. 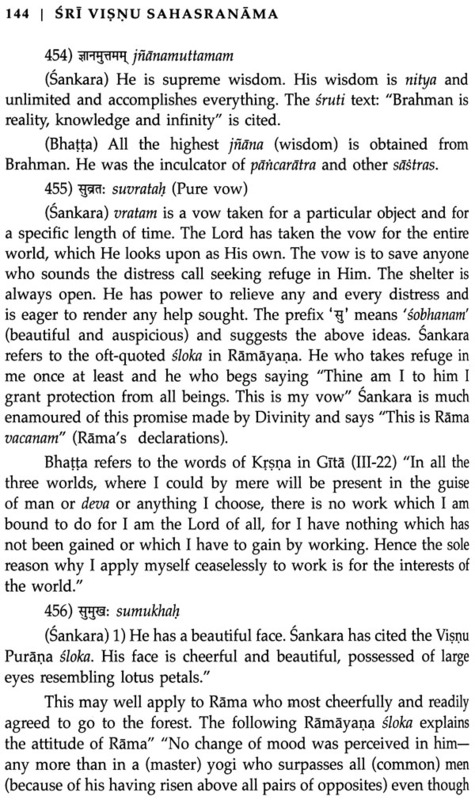 ), but there is only one Sahasranama Stotra in praise of Visnu. It is found in Chapter 149 of the Anusasanika Parva of Mahabharata in the dialogue between Bhisma and Yudhisthira. It consists of 142 slokas. Excepting 13 slokas at the beginning and 22 at the end, the remaining 107 slokas contain the thousand names of God. It is held in grate veneration and devotion in all parts of India and recited by persons of all castes and creeds. Any mention of Sahasranama generally pertains to Visnu Sahasranama on account of its popularity and perspicuity of expression. Hinduism is based on the Vedas, the eternal scriptures revealed to the sage and seers. The Veda is divine in its origin. It is considered to be the breath of God Himself and is nitya or eternal. It is apauruseya (impersonal) and transcendental. 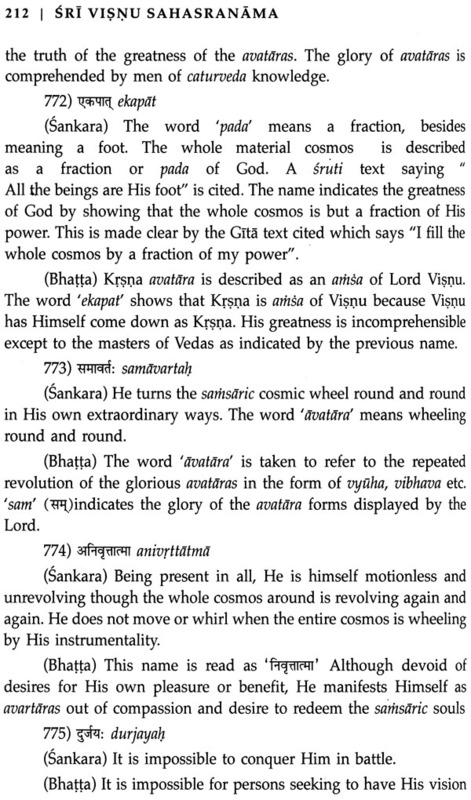 It is considered authoritative by those learned in the ltihasas and Puranas: “There is no sastra (authority) higher than the Vedas, no God higher than Kesava.” The Vedas can be understood in their fullest scope and extent only when studied in correlation with the teachings of itihasas and Puranas. The Itihasas are consequently, the Mahabharata is an infallible guide to Vedic study and is appropriately called the fifth Veda. Sri Visnu Sahasranama is the heart and quintessence of the Mahabharata. Mahabharata is itself considered to be a commentary on the Sahasranama. The Sahasranama chapter occurs in the context of Bhisma expounding Dharma for the purpose of laying down the essence of the sastras for Yudhisthira. Vedavyasa, who is considered to be an avatara of Visnu called the names from the sayings of eminent rsis, like honey gathered from various flowers. They have come down traditionally. The existence of a logical connection between one name and another is quite apparent. 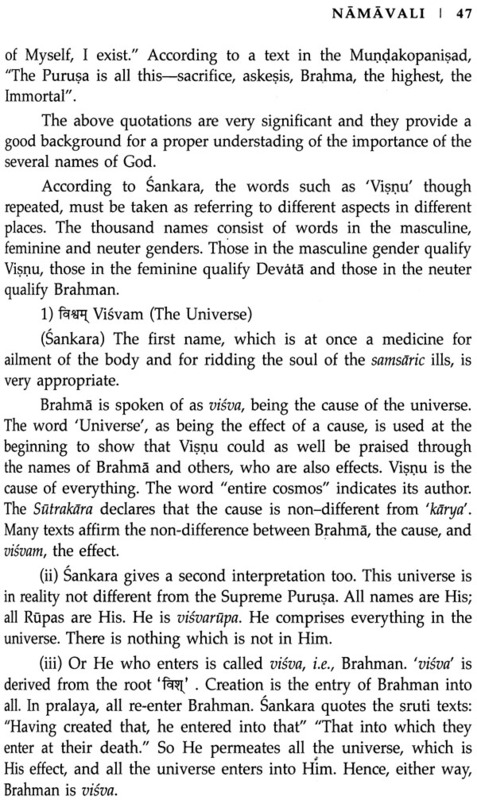 The names (Sarvadrgvyasah) (572) and (Vacaspatirayonijah) (573) in the Sahasranama refer to Vyasa as an avatara. Vyasa was the repository of tapas, divine wisdom, santi and other great and good attributes and a very great Maharsi. He arranged and classified the Vedas and also composed Puranas for the sake of the enlightenment of mankind. 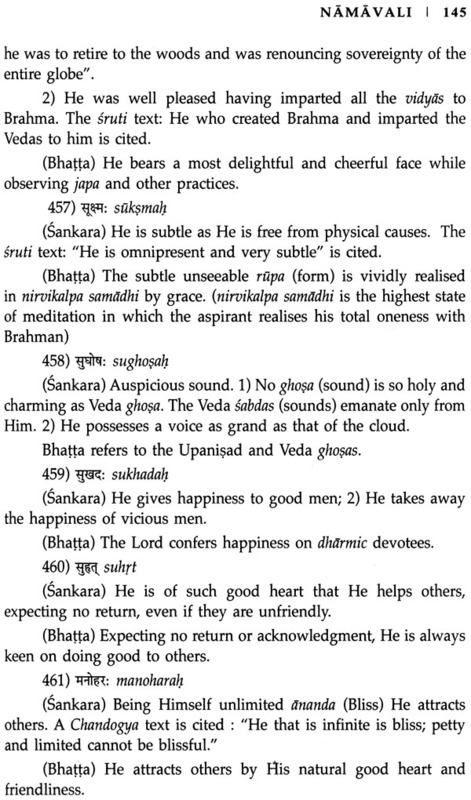 The whole body of Upanisadic literature was systematised and summed up by Vyasa in the Brahmasatras. 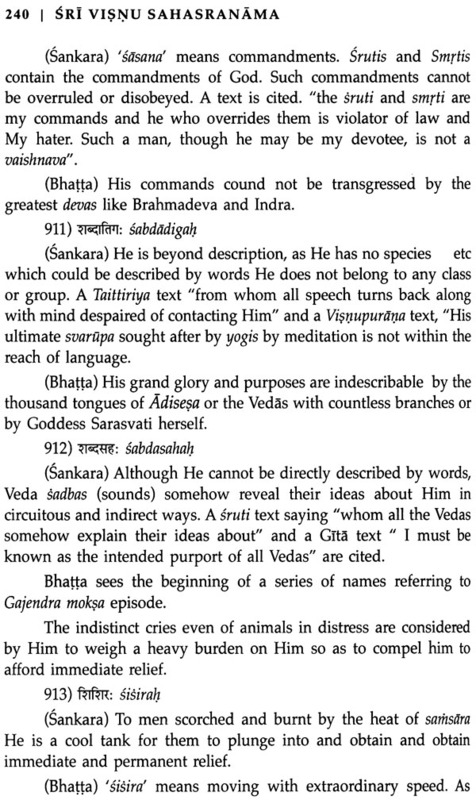 The following Puranic texts referring to the glory of Mahabharata and its author Vyasa deserve citation. 1 "The venerable Vyasa churned the ocean of the Vedas using his intelligence as the churning rod and produced for the good of the world the moon called the Mahabharata" (Vayu Purana and Siva Purana). 2 "Man is afraid of the Sastras like a sick person who avoids a bitter drug. Hence it is that the essence of all the Sastras has been pressed into service to bring forth this Mahabharata as a delightful poem" (Bhavisyat Purana). 3 "Know then that Vyasa, called Dvaipayana, is no other than Lord Narayana Himself. Who else could have produced this great work called Mahabharata?" 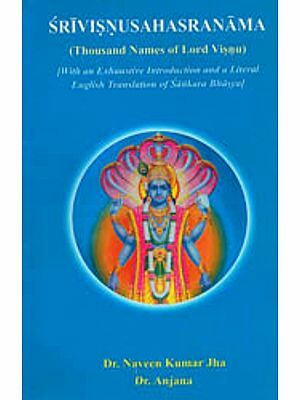 (Visnu Purana). The Sahasranama is the essence of the essence of the Vedas and deals with the nature and glory of the Ultimate Reality in all the varied aspects and the realization of the highest goal of life. As a form of literary writing the Sahasranama is peculiar to Sanskrit literature, like the Sutra and the samasa. It is a difficult vehicle of expression. The author has to embody his religious thoughts and feelings, his philosophy of life as well as theological beliefs through the names with which he adorns his favourite deity. He has no room for the elaboration of his ideas nor even for the provision of logical connection between one name and another. The names have to be strung together like the words in a samasa without any conneting link. As a very learned professor has remarked, "the resulting structure is like a building in which the walls are formed by neatly chiselled stones being placed one above the other without any cement or mortar between them". As a literary form, it has both advantages and disadvantages. If it encourages brevity and restraint, there is probable incoherence and obscurity. Besides, it is not an easy task to devise a thousand names without repetition. It will also be a difficult task for the commentator to interpret the names repeated once or twice. Though the literary form is difficult it can doubtless be affirmed that Vedavyasa has achieved magnificent success. Among the thousand names, as many as 84 are repeated twice and eleven thrice. But the repetitions are not casual or accidental. They permit of different interpretations according to the different contexts.